Obviously, people know me for my tree of life pendants, but lately, I've been on a heart kick. So I've been making one-off heart pendants out of wire instead. I freeform the shape, then hammer the crap out of them to temper, texture and harden the wire. 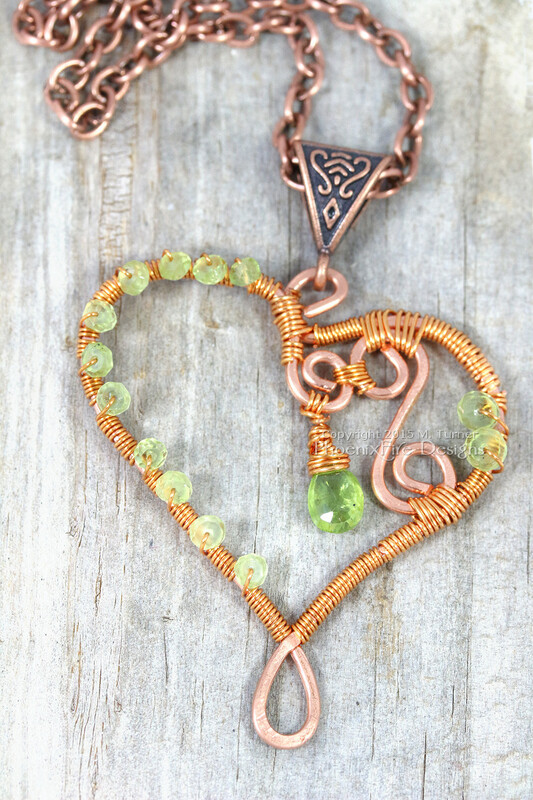 Next I embellish each piece with various wire wrapped gemstones. This one is a tarnish-resistant solid copper with spring green peridot (August birthstone) rondelles wrapped around the edge, with a matching peridot teardrop dangle. I added a detailed Celtic-knot inspired bail and finished it on a 20" chain. 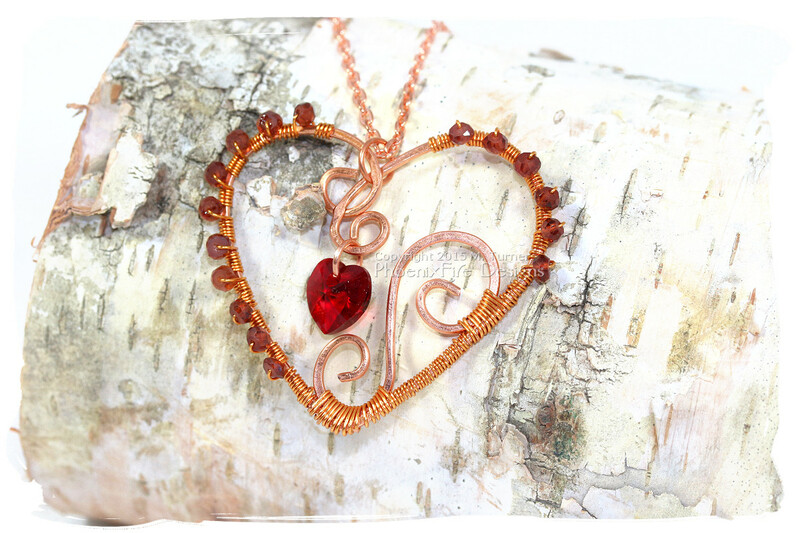 This handcrafted wire wrap necklace is also made from hand hammered, textured copper wire shaped into a heart and accented with rich, dark red garnet gemstones and a red siam Swarovski crystal 3D heart dangle. It features a large spiral and hangs on a matching rose gold, bright copper chain. 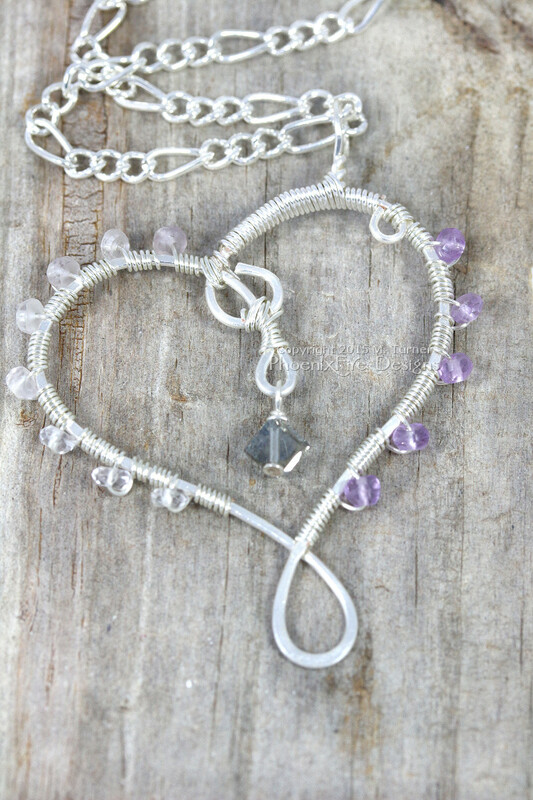 This heart pendant is made from tarnish-resistant silver plated wire which is hand formed into a heart and then accented with an ombre of nearly clear through pale violet purple amethyst rondelles and a color-changing Swarovski crystal twisted cube. Stunning! You are such an inspiration! Aw, that's so flattering. Thanks! They all look great but I have a favorite: the red one because of the shapes you put inside. There seems to be a "flow" in it that is very pleasing to the eyes. I love the little added beads on the sides. Fantastic work! These are beautiful. Well done. Thanks! These were fun. I should do some more again.